Millions of Filipinos are working across the Middle East. Pastor Peter Dulnuan and his family have served a growing congregation of Overseas Filipino Workers in the United Arab Emirates (UAE) for over 10 years. These OFWs are far from their family, so it is the heart of Peter’s church to help them find community and the love of God. Working in the church gives them the skills to take the gospel to their workplace. 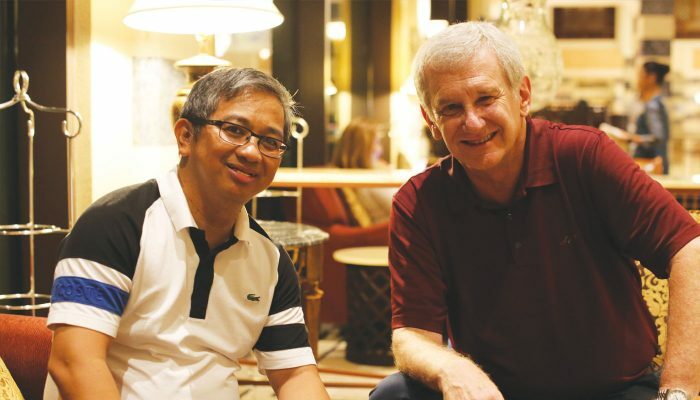 AP Media Director Bill Snider sat down to talk with Pastor Dulnuan during this summer’s Multiply Training Seminar in Dubai to get insights on the opportunities for media ministry in this part of the world. Q. Peter, tell me about your church, Vision Community Global Ministries. A. Vision Community Global Ministries (VCGM) is a group of over 300 members, primarily Filipino, with some other nationalities. We are based here in Dubai, but we also have services in Abu Dhabi. Q. Tell me about how your church is ministering in the UAE. A. We are called primarily to the Filipino community. There are almost a million Filipinos, mostly overseas contract workers, in UAE. The church ministers to them. Some stay long with their family. Some get married here and raise families. We provide them a community where they can grow, a community that can direct them and protect them from things that can lure them toward the worldly things. We give them an opportunity to connect with Jesus and know God more. Q. How did you get interested in doing media training in Dubai? (apmedia.org) I saw that you have many resources we could use with the Filipino community here in UAE and realized doing media training here would be useful. I was thankful to the Lord that you finally came to do hands-on media training with our church leaders. A. We all use social media, but we have not been able to utilize its potential to move the church forward. Your training has enlightened us. We are now aware that there is something that media can do for the church. I think there is a great stirring in the church now, a realization that we need to step forward and maximize the effectiveness of media for the church. Q. What is the vision that you see the church having as it incorporates media missions? A. We pray that out of this, a media ministry team will come together. I also see this training as something that will propel our worship services, giving us increased know-how for using equipment and doing presentations. Q. How can people who read this pray for the church here in the Middle East? A. Pray for God’s revelation, especially to the locals and to other nationalities that come here. Pray for people to receive from God. He is stirring the hearts of the people in this place, and we pray for them that something real will happen in their lives.